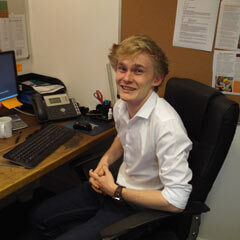 As one of MVIS’ newest team members, Tom has quickly settled into his role as an Admin and Sales Apprentice. Whether it’s helping out with quotations or answering any queries that our customers may have, Tom has quickly gained an impressive amount of knowledge about MVIS’ traffic and events management portfolio. He’s also keen to help out where he can, whether that’s with invoicing or providing an extra pair of hands at our exhibitions.